ALTA Integra Green Building Architecture Service’s Philosophy is to design a futuristic building that is integrated as a whole with a healthy and comfortable acoustics, lighting and ventilation, a system that have the ability to adapt to climate changes, energy conservative and environmental friendly. We named that system Smart-Green-Adaptive-Comfort. ALTA Integra Green Building Architecture Service is an architectural service that designs, renovate, and preserve buildings to get the LEED Green Building Certificate. ALTA Integra Green Building Architecture serves to design houses, offices, hotels, schools, hospitals, warehouse, industrials and many more. ALTA Integra Green Building Architecture – Integrated Project Management is a management service that is integrated to reach a target design starting from function, productivity, environmental friendly, beauty, and cost efficient. ALTA Integra work cycle Building Architecture – Integrated Project Management – LEED Certification started from the creation of concept until building function evaluation. ALTA Integra Green Building Architecture – Integrated Project Management if implemented it will give advantages for investors, society, and environment. Starting from environment friendly house, comfort, safety, productivity and energy conserving that can impact positively on financial standpoint. Exposed starting from shaping the perception of work that is integrated until project integrated evaluation that has been done. ALTA Integra works and collaborates with selective architects and engineers with experience. Consultants that is formed from creative specialists and technical specialists. Technical specialists are technical consultants in acoustics, lighting, thermal, ventilation, electrical, audio, video, informational technology and automation. A project can be called successful if the aspect and the target of the project have a clear definition starting from the concept phase, developing plan, and the execution of the project. Understanding and developing every phase by a professional team that is independent that is chosen by considering the aspect and target that wants to be achieved. In other words, the interconnection of target starts from functionality, productivity, energy renewed, beauty, security, safety, preservation, accessibility, also with reducing cost have to be understood, evaluated, and implemented. Integrated Project Management work phase starts from making a design concept but also the function of the building that is derived from business concept, marketing, and financial plan. The creation of the design concept and building function starts from the theme of the design, function, needs, requirements, technology for work, usage, energy, treatment, durability, safety, and comfort. Every aspect and target that was reached is an important step that determines the rate of success of the project. Studies shows that the comfort through acoustics, lighting and thermal can result in increased productivity for those who are using the building. Implement a design that integrates every factor so that it can reach the target comfort through both physiology and psychology to get a healthy state of mind. That covers the design of Air flow, lighting, tranquillity, room utilization, features, and technology. Implementing elements and renewable energy to create a building that is eco-friendly. Making a design with the use of environmental energy as effective as possible. Optimizing the use cycle of air and energy in a building. Choosing materials and working process that are environmental friendly. Increase the environment quality in a room starting from the easy and comfortable utilization of the room until the maintenance procedure that is environmental friendly. Brainstorming and make a target design like shapes and perception of the building, room, building elements, materials and holding on the principals of Integrated Project Management. Brainstorms and make a target design for safety and security of the users of the building and also the property that it contains. Technical design protects physically towards natural threats and man-made threats. Natural factorthat threatens safety, threatens human lives, and property are natural disasters like earthquakes, floods, and more. While man-made threats usually happens by human carelessness which are fire, gas leak, and many more. Then there’s also threats by bad human nature, which are burglary, or robbery. Integrated Project Management also thinks the effect of design towards the preservation of history, culture and nature. In general, preservation of historical building can be grouped into 4 approach which are, preservation, rehabilitation, restoration or reconstruction. A successful building is a building that is understandable and used by everyone. That includes used by people who have limitations. These limitation includes children, elderly and people who have disability which includes deaf, blind, color blind, word blind, and many more. Integrated Project Management devise and prepare access towards people who have limitations to do activity in the building. Make a plan and controls costs that is clear and transparent from the early stages, that is making the concept, developing design and engineering, construction work, testing, work inspection, until design evaluation. Scoring cost factors starts from selecting materials, working system, and more. Cost factor is not everything, because it also have to be considered with other factors such as beauty, nature preservation, historical preservation, security, safety, health and many more. From the beginning, ALTA Integra is committed to provide an architecture service with quality that is measureable by standards. The purpose of this is to allow the design of a sophisticated technology that is appropriate for economy and is sensitive towards the needs of humans along with its environment. Alta Integra have a reputation to handle technical and design with big and challenging complex and the types of building that is beneficial to attract specialized skill architects. With offering comprehensive sophisticated skill and multidiscipline teams, ALTA Integra together design a building and open for project collaboration. 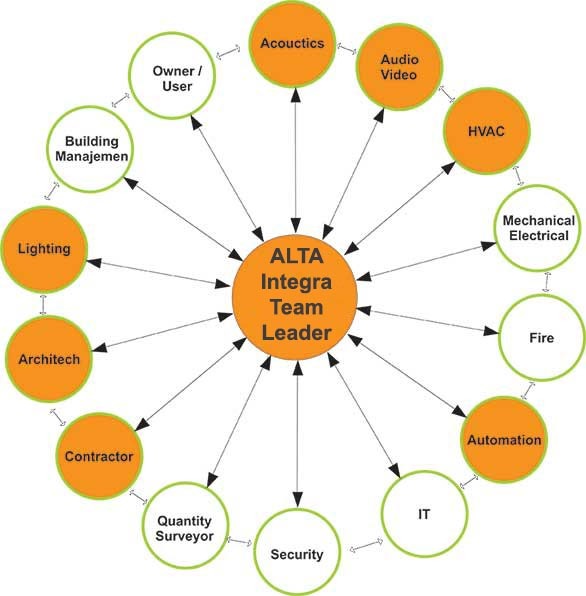 ALTA Integra collaborates with many contractors and consultants. Consultants that collaborates ALTA Integra are none other than : Atelier Cosmas Gonzali, PDW Architect, DHTDT Architect and many more. Contractors that collaborates with ALTA Integra are none other than : Pembangunan Perumahan Persero (PP), Wijaya Karya (WIKA), Takenaka, Total Bangun Persada, and a few other more. If there is a need for more information about engineering consultations/Integrated Project Management, you can call us or fill the form below.